For all the cost cutting that has traumatized the newspaper industry this year, profitability is falling far faster than sales, suggesting that deeper cuts may be necessary if the industry is to sustain its traditional operating margins. In the first part of the year, revenues have fallen by 9.4% in the newspaper divisions at half a dozen major publicly held companies, according to an analysis of the earnings reports issued by them in recent days. Despite aggressive cost cutting in the period at most companies, the operating profits for the same group plunged 25.3%. Thus, profits fell 2.7 times faster than sales dropped. Unless sales improve or the industry is willing to accept lower profitability in the future, the companies evidently would have no choice but to consider even further spending trims. The companies covered in this analysis were Journal Communications (JRN), Gannett (GCI), Lee Enterprises (LEE), McClatchy (MNI), New York Times Co. (NYT) and Scripps (SSP), which report their results in sufficient detail to enable this analysis and also represent a fair composite of industry performance. Each of the companies in recent days reported lower quarterly sales and earnings. For all but Lee, the data included in this analysis reflect the company’s performance in the first six months of the year. In the case of Lee, the data are based on its performance in the first nine months of its fiscal year. The analysis stripped away the performance of non-newspaper divisions and such one-time events as the sale last year of the NYT broadcast group or the writedowns that several companies are taking this year to reduce the value of the goodwill associated with certain acquisitions. Continued sagging sales, goodwill writedowns and hefty interest payments in the cases of several pubishrs were responsible for the deep earnings declines reported in the last few days. When you look at the actual business of running newspapers, however, it is notable that the average operating profit among the six publishers is 18.5%, as measured by earnings before interest, taxes, depreciation and amortization (EBITDA). For all that ails the industry, this surpasses the EBITDA of such companies as Chevron (18.7%), Boeing (11.2%), Wal-Mart (7.7%) and Amazon.Com (6.0%). If publishers, their shareholders and lenders were wiling to accept significantly lower levels of profitability in the future, then further cuts would not be necessary in staff, newshole, circulation and certain other variable expenses. If this were not the case, which it likely will not be, then more cuts would seem to be on the way. “A billion here, a billion there and pretty soon you are talking real money,” goes a famous quote attributed to Sen. Everett McKinley Dirksen, the late, gravel-voiced Republican leader from Illinois. The quote, which actually may not have been uttered by the great man, came to mind this morning when several sharp-eyed readers noted that I incorrectly stated here the price paid for the Minneapolis Star Tribune when McClatchy bought it in 1998. The value should be $1.2 billion, with a B. Not $1.2 million, as I originally wrote it. Thanks to all of you who were kind enough to write in. This proves conclusively the value of copyeditors, if ever there were any doubt. The most precariously financed newspaper deals apparently are starting to hit the wall, wiping out equity investors and causing at least some lenders to try to sell their loans at distressed prices. The lenders who provided the bonds for the $530 million purchase of the Minneapolis Star Tribune in 2006 have hired an investment bank to try to sell the loans at heavy discounts to either local investors or bottom-fishing hedge funds willing to take a risk on turning around the business, according to a report in Finance and Commerce, a Minnesota business magazine. The magazine reports that the Strib’s debt, which amounts to about $430 million, is selling at prices no better than 53 cents on the dollar. Earlier this year, Avista Partners, the New York investment firm that joined publisher Chris Harte in providing equity funding for the deal, wrote off their $100 million investment. Thus, the newspaper’s value appers to have dropped 40% in just 1½ years to approximately $218 million – assuming someone comes along to buy the newspaper’s debt at a 50% discount. That current estimated value is but 18% of the $1.2 billion that McClatchy paid for the paper when it acquired the property in 1998. Elsewhere, the stock of Journal Register Co. plunged to a new low of 9 cents a share today after it evidently defaulted on its $640 million in debt. This effectively wipes out the investors who own more than 39 million shares of the company’s stock. Why publicize newspaper job cuts? A hundred chairs plastered with pink slips were set up in front of the Baltimore Sun today as the centerpiece of a protest against the latest staff cuts at the paper. It was a clever bit of street theater. But was it a good idea? I am as angry as anyone about what is happening at the Tribune Co. (and elsewhere) and I am as sympathetic as can be toward the people who are losing their jobs. But I don't see the point of going to these lengths to publicize the job cuts. All the demonstration did was call further attention to the unfortunate decline of the newspaper, which may cause readers to unsubscribe and advertisers to unadvertise – perhaps hastening the day there will be more layoffs. So, how is this a good idea? You know better than I do that the transformation in the newspaper industry is bigger than any single protest. Show me where keeping your mouth shut in this business has generated more ad revenue or resulted in circulation gains. 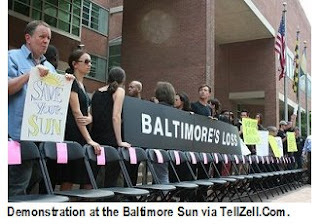 So, why not protest 100 job cuts at the Baltimore Sun? Reporters, editors, columnists, copy editors, photographers love the paper and take pride in putting out an exceptional product, but they are tired of the cuts, they are tired of being told to “do more with less,” they are tired of the uncertainty. Why not tell the public that the newspaper might be better off in local hands? Why not wave signs that read, “Sun Burned” or “Sun Lite”? Will the protest drive circulation down at The Sun? It might. Will some advertisers pick up and leave? Possibly. But management has driven away more advertisers and turned off more readers over the years because of its inability to understand the power of the Internet and react to it. For years, we have watched management struggle to figure out how to reach readers and service advertisers. For years we've watched them ignore their clunky websites because they were too busy dreaming up products that ultimately flopped. Today, the employees are the ones paying the price. :: How close to default is your newspaper? Could this drumbeat of negative headlines and stories be responsible for driving down newspaper circulation and stock prices? Can we blame these stories for priming the pump for the next round of layoffs? In a month's time, when readers open The Sun and no longer see the faces of the columnists they once loved to read, then you will see real declines in circulation and advertising. So, why not protest? Why not vent? Maybe somebody will listen and The Sun will be placed in better hands. 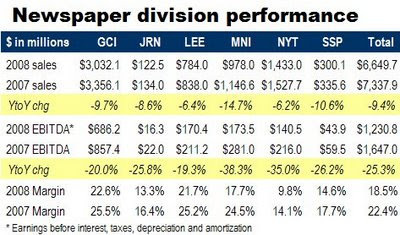 ‘Private’ time for GCI, LEE, MNI and NYT? The shares of Gannett, Lee Enterprises, McClatchy and New York Times Co. have fallen so low that the companies have become candidates for transactions that could convert them to private ownership. The companies could do it themselves, do it in partnership with private-equity funds — or potentially face unwanted takeovers from investors attracted by the bargain prices of their stock. A public company taking itself private almost surely would face suits from shareholders angry about the monumental trading losses suffered in the last few years. Shareholders could argue that the companies were being sold too cheaply because management had been misfeasant – or worse. But the ability to escape the pummeling of the public market – and focus wholeheartedly on rescuing their troubled businesses – could encourage the brass at Gannett and Lee and the families at McClatchy and NYT Co. to look into going private. While these four companies theoretically could go private on their own, they might welcome cash infusions from compatible private investors to fund the strategic initiatives that newspapers ought to be making to salvage their relevance, readership and revenues before it’s too late. But, as my buddy Mark Potts noted here, the historic selloff of newspaper stocks also makes them vulnerable to unwanted overtures from daring investors seeking to buy the companies at historic low prices in the hope of turning them around. Although newspaper stocks have been beaten to smithereens, not all companies are candidates for either a going-private transaction or even an unwanted takeover. One key to determining a company’s likelihood of going private – or being targeted by a raider – is the amount of debt it has in relation to its operating earnings. If a company’s current obligations are light, there may be room to borrow the money necessary to buy its stock back from public shareholders. If the company has fully utilized its borrowing capacity, it most likely wouldn’t be able to get enough money to purchase its shares. In the case of Gannett, its debt of roughly $4 billion is two times the $2 billion in EBITDA that it generated in the last 12 months. To buy its outstanding public stock at a 20% premium over its current price, the company would have to borrow another $4.5 billion, bringing its total debt to about 4.3x earnings. By abolishing its dividend payment, a common practice in a going-privtae transaction, the company would add another $366 million to its EBITDA to bring the so-called leverage ratio down to an even more conservative 3.6x. A little more than a year ago, lenders were willing to give Sam Zell more than 9x EBITDA to buy the Tribune Co. But the upper limit today for this sort of deal probably is no more than 6x earnings – and maybe less. Lee Enterprises is the easiest call, because a private transation would not change the ratio of its debt and cash. If Lee stopped paying its annual dividend and added those funds to its operating earnings to finance the purchase of its shares for a 20% premium over their price of $150 million, its debt-to-EBITDA ratio would be the same after the deal as it is now (5.3x). The story would be roughly similar at McClatchy and NYT Co. If you add the dividend payments for MNI's common stock to its cash flow, its leverage ratio would be 4.7x after going private vs. 4.4x now. Following the same formula at NYT, the post-transaction ratio would be 5.3x vs. 2.3x today. The before-and-after difference is greater at NYT, because the Times would have to borrow $2 billion to buy its outstanding stock while McClatchy needs only $467 million to acquire its shares. Given the depressed value of their shares and the relative ease of financing a potential transaction, companies like MNI and NYT could be on the radar of hostile takeover specialists. Although an unsolicited bid theoretically could be repulsed by the dual stock structure that gives the founding family at each company a veto over any unwanted overture, Rupert Murdoch demonstrated in his successful acquisition of Dow Jones that a clan’s resolve can be worn down with a sufficient amount of cash. The Washington Post Co. would be less appealing to raiders because someone would have to borrow a prohibitive 10x earnings to take it private. The hefty financing would be needed because its common shares are worth $5.5 billion and its 16.5% profit margin is lower than the historic industry norm. WPO could go private by accepting additional equity from a friendly investor like board member Warren Buffet, but the Graham family would have to agree to the dilution of its holdings, plus a potential reduction in its preferred dividends. A.H. Belo (AHC) could be taken private rather easily. It has no debt but sufficient cash flow to fund the loan that would be necessary to buy its shares. If management didn’t act, these characteristics would seem to make the companies vulnerable to an unwanted overture. Scripps would have to take on too much debt to take iself private. In the initial version of this post, I stated that SSP could take itself private as the result of relying on erroneous information posted at Yahoo Finance. The going-private route probably is not in the cards for Journal Communications (JRN) and Media General (MEG), because each would have to assume more than 6x debt. They could generate extra cash to de-lever themselves by spinning off assets, but this is a less than ideal time to be trying to sell newspapers. Although the shares of GateHouse Media have been battered to the point that its market value is just $59 million, the company is unlikely to be able to go back to the private ownership it enjoyed until it went public in October, 2006. Because it already has borrowed 10x its operating profits, GHS could not qualify for a refinancing unless its existing lenders wrote off something like half of its debt. Journal Register Co. is leveraged too far to borrow even the $5.5 million it would take to buy its shares at today’s closing price. JRCO already is out of compliance with its current lenders and an investor who recently made a tentative offer to help the company seemed to have backed off. The Sun-Times Media Group (SUTM) is not a candidate, because it is losing more money than it makes. Going private has several advantages over being a public company for an industry facing the sorts challenges affecting newspapers. The public markets demand predictable and sustainable increases in sales and profits, or they punish a stock the way they have been spanking newspapers for the last few years. Because newspapers have not found a way to reverse the accelerating deceleration of their sales, they have been cutting the heart out of the core product in an unavailing, self-defeating effort to reach high enough profitability to please Wall Street. But that has not been working, as the relentless pummeling of newspaper stocks attests. In going private, newspapers can arrange the financings in a way to let them lower their profits for a specified period of time. During that respite, they could invest the resulting extra cash in reinvigorating their core print products and developing the interactive enterprises and niche print publications necessary to rescue their rapidly wasting franchises. To be clear: Going private is not a panacea. It only works if sales rebound and profits grow in the fullness of time. Deteriorating revenues and profits will result in the sort of drastic budget cutting that has thrown the egregiously over-leveraged Tribune Co. into a state of utter turmoil. A well-conceived going-private transaction (unlike Tribune’s) would give harried newspaper workers an opportunity to turn their full attention to the business of saving their businesses, instead of battling to sustain unsustainable profits. And they would be working for happier bosses, too, because going-private transactions typically result in significant bonuses for the executives who execute them. So, everybody would win. Readers, advertisers, newspaper employees, publishers and the lawyers, investment bankers and lenders who engineered the deal. Everyone, that is, except the former shareholders. Disclosure: I own shares of JRCO, MNI and SSP. In a historic rout, newspaper shares have lost nearly $4 billion in value in the first 10 trading days of July, an amount greater than the combined market capitalization of all but the three largest publicly held publishing companies. :: A.H. Belo (AHC) today is worth $119 million, down 58% from $282 million when it began trading earlier this year as a free-standing newspaper publisher. :: GateHouse Media (GHS), worth $59 million, down 95% from $1.2 billion at its curiously strong initial public offering in October, 2006.
:: Journal Communications (JRN), worth $266 million, down 78% from $1.2 billion on Dec. 31, 2004.
:: Journal Register Co. (JRCO), worth $6 million, down 99% from $746 million on Dec. 31, 2004.
:: Lee Enterprises (LEE), worth $145 million, down 93% from $2 billion on Dec. 31, 2004.
:: Media General (MEG), worth $248 million, down 83% from $1.5 billion on Dec. 31, 2004.
:: McClatchy (MNI), worth $387 million, down 93% from $5.7 billion on Dec. 31, 2004.
:: New York Times Co. (NYT), worth $1.85 billion, down 67% from $5.6 billion on Dec. 31, 2004.
:: Scripps (SSP), worth $522 million, which was newly launched as a pure-plan newspaper company on July 1, 2008. More details below. :: Sun-Times Media Group (SUTM), worth $32 million, down 98% from $1.3 billion on Dec. 31. 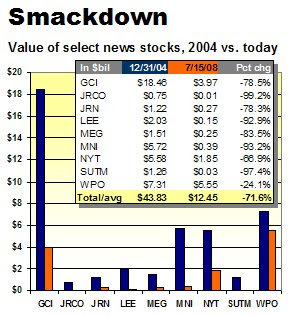 2004.
:: Gannett (GCI), worth a bit less than $4 billion, down 79% from $18.5 billion on Dec. 31, 2004.
:: News Corp. (NWS), worth $37.2 billion, down 36% from $58.4 billion on Dec. 31, 2004.
:: Washington Post (WPO), worth $5.5 billion, down 24% from $7.3 billion on Dec. 31, 2004. At today's close, the total decline in value of the dozen newspaper shares trading since the first of the year was nearly $27.7 billion, a plunge of 35.7% in 6½ months. This calculation does not include the shares of Scripps, which dropped some $6.2 billion in value on July 1 after the company’s non-newspaper assets were spun into a separate company. Counting Scripps, the aggregate value of newspaper shares dropped $10.2 billion since the first of this month. When you back SSP out of the calcuations, you find that newspaper stocks have slipped $3.9 billion since July 1. 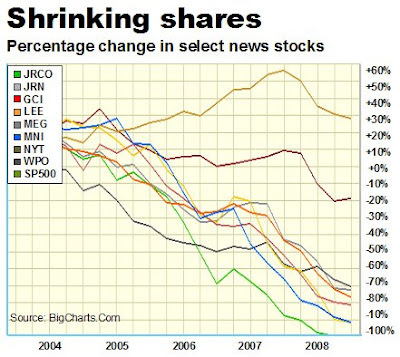 If you want to be more depressed, take a look below at the performance of nine newspaper stocks that have been around since 2004 in essentially the same incarnation, give or take a few mergers. The collective value of this group has plunged $31.4 billion, or 71.6%, since Dec. 31, 2004. Before you get too upset, remember the month is only half over. The shares of five newspaper publishers plunged to new lows in early trading today, including the shares of GateHouse Media, which fell to $1 per share, threatening its ability to remain listed on the New York Stock Exchange. Tumbling to new lows alongside GHS were Gannett (GCI at $16.43 per share), McClatchy (MNI, $4.58), News Corp. (NWS, $13.95) and New York Times Co. (NYT, $12.61). The companies sank to new historic lows on Friday, as reported here. Media General (MEG) hit a new all-time low of $10.23 per share on Monday. All the closed higher than the lows they touched in the morning. GHS took the worst drubbing of all. As its shares fell to as low as $1, its market capitalization sank to some $60 million, which represents a 425% plunge since June 30. "The shares could be worthless," said Morningstar analyst Tom Corbett, as quoted by Editor and Publisher. "Even if GateHouse completely eliminated its dividend, given the combination of its high debt load and our unfavorable outlook for the industry, we think this would provide only short-term relief for equity holders." GHS is in danger of losing its listing at the Big Board, where rules require a stock to trade about $1.10 a share to remain listed at the exchange. While a company has a certain grace period to restore the value of its shares. As explained previously here, a stock is not permitted to trade on the floor of the Big Board if it falls below $1.05 a share at any point. Floor trading in a stock can resume at the Big Board if it trades above $1.10 a share for a full day, but a stumble below $1.05 for even a minute will put the issue back in the penalty box. If the minimum price cannot be maitnained, then th company is delisted at the exchange. Earlier this year, the shares of both Journal Register (JRCO) and Sun-Times Media Group (SUTM) were booted off the Big Board. They now trade on the Pink Sheets, an electronic marketplace that can be accessed as readily by a broker as shares that are traded on the Big Board. The average online advertising rate dropped 14.2% in the first six months of the year, according to a new industry survey. Demonstrating that even interactive advertising is not immune to the deterioration of the economy, PubMatic, a company which helps publishers optimize their revenues, reports that the average rate for 1,000 ad impressions fell to 36 cents in June from 42 cents in January. PubMatic says its survey is based on the prices realized by the 4,000 publishers it assists in getting the most revenue for their available ad inventory. The company has been publishing this survey since the first of the year and, in the absence of any other similar ongoing report, the data gives a sense of the direction of the market. And the direction in the second quarter of the year was down. After climbing in the first three months of the year, ad rates fell sharply in April and continued to deteriorate in May and June, according to the survey. PubMatic tracks rates according to the volume of traffic at websites. As you can see in the table below, sites with the lightest volume of traffic average higher rates than larger ones. Investor bets against Lee Enterprises and McClatchy were more than twice as big last month as those against the shares of Fannie Mae, one of the mortgage giants whose perceived instability jolted the financial markets. The wagers placed against a stock, which are known as short sales, give new insight into the long-running selloff that drove seven newspaper stocks to record lows in a single day on Friday. A short sale occurs when an investor sells shares she doesn’t own in the expectation that a stock’s price will fall and enable her to cover the position by buying shares at a lower price. In other words, she sells high and buys low. The percentage of short shares is a barometer of market sentiment, because the shorts unwind their positions if they think a stock is going to go up. But the indicator is imperfect, because the numbers are not updated daily like stock prices. Instead, the data are issued only episodically by the securities exchanges. As any newspaper publisher will attest, you have to be careful about projecting future outcomes by relying on historic information. Still, the short data published on June 10 makes for some interesting reading. As you can see from the table below, a staggering 38.6% of LEE’s stock was sold short in mid-June. That is 2.7 times greater than the 14.1% of Fannie Mae sold short at the same date. And it is almost identical to the 37.2% short position at the same time at IndyMac Bancorp, the insolvent bank seized Friday night by federal authorities. The 28.3% short position at MNI was 2.2x greater than the percentage of shares shorted at Freddie Mac, the other federally-chartered mortgage insurer, whose shares last week plunged along with those of Fannie Mae. Only 12.8% of Freddie Mac was sold short in June. 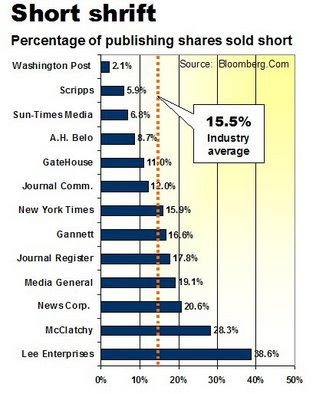 The average percentage of short shares at the 14 publicly traded newspaper companies in June was 15.5%. Short positions were in double-digits at nine of them. By comparison, the short positions were respectively 13.7%, 6.0% and 3.8% at Lehman Brothers, Starbuck’s and Yahoo, three companies that have faced their own share of bad news in recent weeks. When the new data comes out, we'll take another look to see if the shorts are done spanking newspapers. If you watch the ticker in the meantime, you will get a pretty good idea of which way things are going. Sparing few efforts to raise cash to service its daunting $12.6 billion in debt, the Tribune Co. has taken a highly unusual step for a media company: Borrowing against its future ad revenues. While it is commonplace and legitimate for companies in many industries to borrow against the value of invoices that customers have yet to pay, most media companies never needed to do this, because their operations historically generated more than enough cash to remain solvent in the few weeks between running an ad and getting a check for it. But the Tribune Co. reported in a brief press release issued on the eve of the Fourth of July weekend that it has established a line of credit enabling it to borrow up to $300 million against the future value of the advertising revenues that it books. The company already has taken down $225 million of the available funds. This move, which is roughly akin to a strapped wage-earner borrowing against his next paycheck in what often is called a "payday loan," is but one of several initiatives that Tribune has undertaken to ensure it has sufficient cash to fund the $962 million in interest payments it is obligated to pay this year. Other steps include selling Newsday, reducing its newspaper staffs by double-digit percentages, dropping 500 pages of newshole a week across its portfolio of publications and cracking down on the consumption of office supplies. Tribune’s decision to borrow against its receivables struck several media-finance experts as not only unusual but also slightly self-defeating. Instead of waiting for its money for the 60 days it normally takes most advertisers to pay their bills, Tribune will be giving up some of the proceeds in interest payments to Barclays Bank, ensuring that the publisher will collect something less than 100 cents on the dollar. Tribune did not disclose the terms of the loan, so it is not possible to tell how many pennies it will have to fork over to the bank. If the company paid 7% interest on $225 million for a full year, the bill of nearly $15.8 million would just about pay the salaries of the 150 journalists about to be axed at the Los Angeles Times. Interest of 3.5% for a full year would be nearly $7.9 million, or just about enough to fund the annual compensation of the 80 journalists about to be cut at the Chicago Tribune. A spot check of newspaper companies determined that no major publisher has found it necessary or economically advantageous to finance its receivables in the same way. The concept is new to Tribune, too. Upcoming cuts at a pair of Tribunes show how publishers are nibbling away at the long-held standard for the minimum number of journalists deemed necessary to staff a newsroom. The unwritten but widely honored rule of thumb in the industry always has been that a newspaper should employ one journalist for every 1,000 in daily circulation. But plans announced today to lighten the Chicago Tribune newsroom by some 14% to 498 journalists will drop the ratio there to 0.88 newsfolk for every 1,000 of the paper's 556.8k daily readers. The staff will be 25.7% smaller than it was in 2005, according to the newspaper. The ratio will be 0.90 journalists per 1,000 readers at the Tampa Tribune, which last week announced plans to eliminate a fifth of its news jobs. Those cuts will leave the paper with 200 journalists to serve 220k readers. In other recently announced staff reductions, the Los Angeles Times will have a ratio of 0.92, the Baltimore Sun will be 0.98, the Kansas City Star is going to 1.00 and the Palm Beach Post will be 1.11, according to the cutbacks logged by Erica Smith at GraphicDesignr.Net. Erica says 1,510+ positions were lost in June and 5,991+ were eliminated in the first half of the year. One of the lowest metro staffing ratios is at the San Jose Mercury News, which today employs approximately a third of the 420 journalists who worked there in 2001. The latest round of cuts has reduced the Merc’s staff to 0.67 journalists for each 1,000 of its 229.5k subscribers. If all publishers adopted the San Jose ratio of 0.67 journalists per 1,000 readers, then the industry would be overstaffed by 17,358 news people. And so it goes. If this is a bad time to be the in the newspaper business, it is a worse time to be trying to sell a publishing company. News Corp. conceded the weakness of the M&A market for newspapers last week, when it abandoned its efforts to sell the Ottaway division that it acquired when it bought Dow Jones last year. Ottaway operates eight dailies and 15 weeklies in seven states from New York to Oregon. Another 22 dailies and 39 weeklies potentially could be added to the market by Journal Register Co., which announced earlier this year that it would review its strategic options. Although this usually signals a business is up for sale, this over-leveraged company has to come to terms with its creditors before it can formally act to put itself on the block, according to informed sources. “This is not a good time to sell newspapers,” says John Morton, the dean of newspaper analysts since 1971. The once ferociously competitive market for newspapers has been chilled, he explains, by historic declines in advertising and the yearlong tightening of the credit market. While it’s entirely possible that transactions for some or all of the available newspapers may be announced tomorrow, the lack of interest in publishing acquisitions appears to be at a modern-day low. 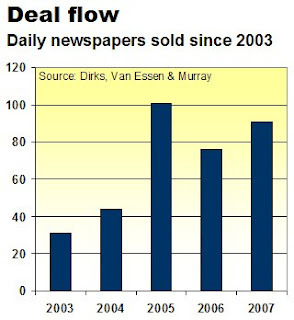 According to records kept by Dirks, Van Essen & Murray, the leading newspaper broker, 91 dailies changed hands last year, 76 sold in 2006 and 101 transactions closed in 2005. Those totals included the mega-deals involving Dow Jones and Tribune Co. last year, Knight Ridder in 2006 and Pulitzer in 2005. But only a handful of small dailies have changed hands in 2008. In the first six months of the year, Dirks completed only four transactions, as compared with 28 deals for all of 2007 and 28 deals throughout 2006. The few deals that are being consummated often involve the sale of individual properties that can be consolidated with the operations of a neighboring buyer. In one case, the New York Times Co. bought the paper in Winter Haven, FL, so all functions but news-gathering could taken over by its paper in neighboring Lakeland. And a publisher with a plant 30 miles away bought the 4.5k-daily Monticello (IN) Herald Journal, according to a press release from Dirks. “The problem we are having with most deals that involve more than one individual property is a lack of purchasers,” says Larry Grimes, the president of W. B. Grimes & Co., whose firm has been brokering newspapers for 49 years. “That has to do with a couple of things. One is a lack of available financing to do the deals. But it also has to do with management at the top of some of the major groups, who, in my opinion, seem to be terrorized in terms of what do to next” in the face of shrinking revenues. Will those traditional buyers come back? In this guest commentary, advertising sales veteran Janet DeGeorge says "change" is a "dirty word" at most newspapers. She is the president of Classified Executive Training & Consulting. Newspaper advertising revenue is down because most advertising departments have not changed the way they do business in 50 years. Well, probably 100 years. They have not changed the confusing and bloated way they charge customers for advertising, they have not changed the organizational structures or goal setting procedures for their sales staff, they have not changed how they manage their managers, often pitting them against each other instead of focusing on customer needs. The lack of imagination in the way many newspapers run their online products and advertising is boring users to run to other places for their advertising needs. Their dealings with generic employment products like HotJobs has lost them both their bread and butter employment advertisers as well as their strong key categories such as Medical. Are you still waiting for Hotjobs to save your classified employment? Even as top Yahoo management is jumping ship? HotJobs is a good search engine, but you have to take care of your own market your own way. But even internally, the often times hostile relationships between print and online, instead of working miracles together, downgrade both products. To be successful you need a stimulating product, a motivated sales force and management that respond to customers needs by being committed to ADVERTISING RESULTS. And that takes change. Opps…dirty word. I dropped the "C" bomb, sorry. Top outside sales reps run after $35 special section ads instead of $3,500 employment display, call center reps outbound call on one time advertisers instead of seeking out year long advertisers, online sales forces sell against their own print products often dissing print and creating a whole lot of switch business. And self promotion? There is none. I just worked with a paper that expenses 10% of classified revenue to promotion each month. They are a 400k circ paper, 140 people in the classified call center busy from 7 a.m. to 9 p.m., an extraordinary array of 13 money-making websites with an internet staff of 120 people. They own their market and are on top of their game. Their advertising managers all have advanced degrees, know how to work the numbers, continually improve their product (they are getting redesigned at this moment by Brass Tacks Design), continually monitor their staff for excellence, have ongoing staff promotions and training. Where is this paper? In Bogotá, Columbia. They own their market even with as many Internet competitors as we have in the United States. Newspaper advertising in the U.S. is in quicksand and instead of reaching out for the rope right in front of their nose and pulling themselves out, they keep throwing their hands wildly in the air and sink deeper and deeper. Common sense has left the building. Tens of thousands of additional jobs may have to be eliminated at newspapers because the staff reductions that have taken place to date have not kept pace with the accelerating erosion of advertising. Even though 48.7% of the 102,120 jobs eliminated in the newspaper industry since 1990 were lost in the last three years, publishers since 2006 have failed to reduce headcount as aggressively as they did during prior downturns, according to an analysis of the industry’s historic performance. To trim headcount enough to sustain traditional profit margins, publishers would have to eliminate far more jobs in the near future than they did in the last two years. How many more? That’s hard to say, because it is impossible to predict how much lower industry sales will fall. But the analysis described below suggests that the industry should have eliminated nearly twice as many jobs as the combined 26,564 positions axed in 2006 and 2007. Thus, precedent suggests that the industry in the last two years should have abolished 23,580 more jobs than it actually did. If sales continue falling as steeply in the back half of 2008 as they did in the first six months, then the number of positions in peril would likely be even greater than the number of jobs that theoretically should have been scrapped in the prior two years. Frequent, far-reaching and traumatic staff cuts brought newspaper employment to a 17-year low of 353,580 individuals at the end of 2007, according to the U.S. Bureau of Labor Statistics. The sum is 22.4% below the 445,700 employees working at newspapers in 1990, the modern-day peak. But the drastic cuts did not kept pace with the fast-deteriorating economics of the industry. The belated realization among publishers that they have been too slow to reduce force evidently lies behind the aggressive plans unveiled by some companies to idle as much as a quarter of their staffs. The Hartford Courant said last week that it would trim its news staff by 24.5% to 206 journalists, the Palm Beach Post said it would slice its headcount by 24% to 950 employees and the Boston Herald said it would thin its ranks by between 24.5% and 28.6%, depending on the final number of jobs it eliminates when it outsources its printing operations. The planned cuts at the Herald would zap between 130 to 160 positions to bring the final headcount to approximately 400 souls. 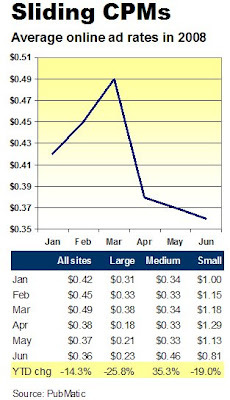 These publishers – and others who soon may follow their lead – are attempting to reconcile their operating costs to the rapidly deteriorating sales of an industry that, as of yearend 2007, lost nearly $6.5 billion, or 13.3%, of its revenues since hitting an all-time high of $48.7 billion in 2000. 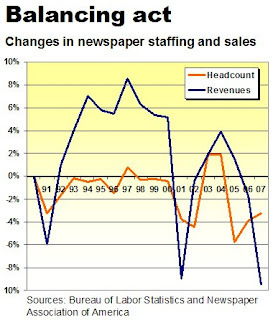 As you can see in the graph below, newspapers historically have trimmed headcount in response to falling sales in an effort meet their profit targets. Payroll is more elastic than such other variable costs as newsprint and fuel, and it is far more elastic than the hard-to-trim fixed costs associated with operating a large fleet and manufacturing plant. If you look at what happened in 1990-91 and 2001-02, you will see that publishers trimmed payroll in both years of each downturn and then allowed staffing to rise as sales recovered. In both cases, payroll was pared by a percentage roughly equal to the degree that sales fell during the two-year downturns. The familiar pattern did not repeat itself in 2006-07, when ad sales fell 11% over two years and payroll declined by a more conservative 7%. Had publishers dropped employment enough to match the decline in sales, they would have had to eliminate some 50,144 jobs, instead of the 26,564 positions actually cut in the period. That’s why it could be argued that the industry should have eliminated 23,580 more jobs than it did. With industry sales on track to slide even further in 2008 than the record plunge recorded last year, a publisher aiming to balance headcount with revenue not only would have to eliminate sufficient positions to match this year’s sales decline but also pare additional jobs to catch up with the shortfall in the prior years. Why were publishers relatively slow to cut headcount in the last two years? One answer may be that they already had reduced headcount by 5.7% in 2005 – the steepest cut in modern history – in a year when industry revenues actually grew 1.5%. The cuts, which defied historic precedent, were undertaken not to manage expenses, as such initiatives had done in the past, but in reaction to growing pressure from investors who were insisting that newspaper profits be boosted in the direction of the higher returns enjoyed by such interactive competitors as Google. These actions (and others) didn’t save companies like Knight Ridder and Tribune from eventually being sold to mollify investors who wanted to cash out of a business that they feared – correctly, as it turned out – was heading in the wrong direction. Rather than shrinking payroll and other expenses to squeak the industry through a tight time, the cuts in 2005 established an expectation of high profitability among investors and bondholders that soon proved to be difficult to maintain. After beginning to erode in 2006, advertising sales have decelerated at a mounting pace ever since. Basing their decisions on the modern precedents available to them, publishers evidently presumed that the downturn starting in 2006 would pass in the same way that the setbacks in 1990-91 and 2001-02 eventually were resolved. If history had been a reliable guide, the publishers would have been right. 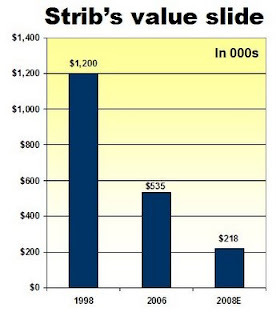 As you can see from the graph below, sales bounced back in both 1992 and 2003. But that’s not happening now, because it’s no longer business as usual for newspapers. The industry is well into a period where its economics are governed by new and unprecedented social, demographic and technological developments that will alter forever the behavior of both advertisers and consumers. Economists call this a “secular” decline, as opposed to the “cyclical” declines that result from the ordinary ups and downs of the business cycle. In other words, the recovery of the newspaper industry this time will require a far more proactive strategy than simply whacking headcount, hunkering down and waiting for the economy to rebound.